Fabrizio Intonti is a photographer and author who has studied philosophy. His photographic production, in addition to professional activity, extends to the visual arts, often relies on the contamination of techniques (analog, digital) and languages (words, images), with the intent to show the extraordinary in the ordinary, whether it be things, people, places. The "White Beaches" is a four kilometers sandy coast near the town of Rosignano Marittimo, in Tuscany (Italy). The particular color of the sand is due to the calcium carbonate discharged from a chemical plant of the Solvay group, located behind the beach, that make the sand white and the sea turquoise. 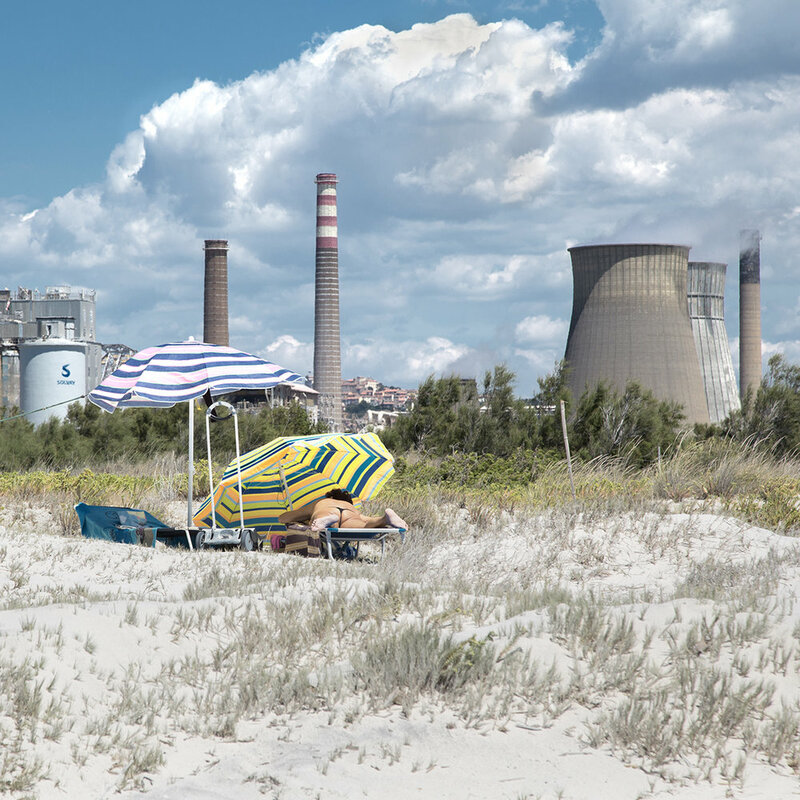 Because of discharges of Solvay, which include various pollutants, the White Beaches are among the most polluted sites in Italy and among the 15 most polluted coastal sites on the Mediterranean Sea (according to the United Nations environment Programme). In the turquoise sea is concentrate 42.8% of total arsenic poured into the Italian sea. Mercury discharged from the plant pollutes the sea area up to 14 kilometers from the coast. Allthough in Rosignano area the cases of mesothelioma cancer in relation to population are the most numerous in Italy and all though each year more than 100,000 tons of waste are discharged in the sea and bathing is banned in a large stretch of the cost, the "White beaches" remain one of the most popular seaside destinations in Tuscany: people don’t want to renonce to swim sunbathe and take selfies in a Caribbean setting.